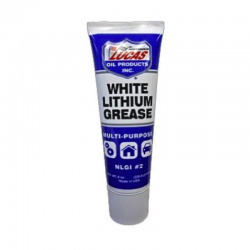 Lucase Oil 8 ounce White Lithium Grease is a popular option to lubricate joints, sliders, and moving parts on robots. 8oz Squeeze Tube is easy to use and has a screw cap. Meets NLGI-2 performance, long lasting, greatly reduces friction and wear. Easy to use squeeze tube with screw cap.